Want to give your child a little at-home maths practise? 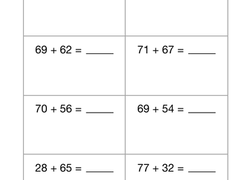 Adorned with airy clouds and a space shuttle, this worksheet lets kids practise two-digit subtraction. Encourage your second grader to embark on a space-themed addition adventure with an entertaining extra: a coloring activity! This colorful worksheet will give your second grader the boost she needs to become a subtraction know-it-all! Use this snail-embellished worksheet to help your second grader master two-digit sums with style! It's okay to monkey around in this maths worksheet! Follow the monkey through the tree as he counts by 7 to get from branch to branch. With its eagle theme and colorful good looks, this worksheet offers style alongside maths help. Watch your child's two-digit subtraction skills soar. 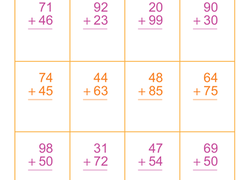 With its two-digit addition problems and healthy dose of carrying, this year three worksheet offers a worthy challenge to aspiring young mathematicians. Invite your second grader to practise double-digit addition in the company of some friendly bugs with this adorable worksheet. Our friend Jimmy needs help packing for his trip, can your child help? This maths sheet will challenge him to colour the correct fraction of each item. Looking to boost your child's maths skills at home? This worksheet helps kids master two-digit subtraction and keeps their interest with a colorful toucan theme. Once your second grader finishes rewriting and solving these challenging double-digit addition problems, they'll get an entertaining reward! Your second grader will decide addition is fun once you introduce them to this charming worksheet: double-digit addition plus coloring! Your child will get a chance to stretch his maths skills in this Christmas word problems worksheet. 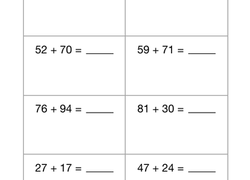 Kids will work on multiplication and more in this worksheet. Your child will love this fun twist on typical maths worksheets as they get to colour in some silly snails as a reward for practising double-digit addition! 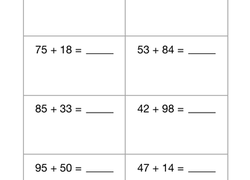 Use this worksheet to engage students in conversations and collaboration with their peers as they represent the values of three-digit numbers using base-ten blocks. 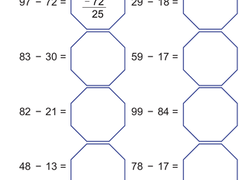 Use this glossary with the EL maths Support Lesson: Base-Ten Blocks. Use this language routine to elicit meaningful conversation among your students! Will students be able to solve the problem by asking their partner for the information they need? 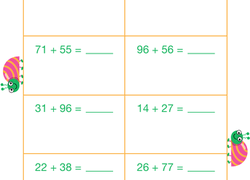 Use this glossary with the EL maths Support Lesson: Multiples of 10. Use these vocabulary cards with the EL maths Support Lesson: Exploring Number Forms. Glossary: Which Number is the Greatest? 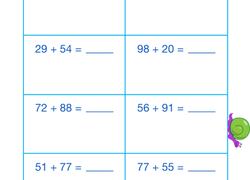 Use this glossary with the EL maths Support Lesson: Which Number is the Greatest? 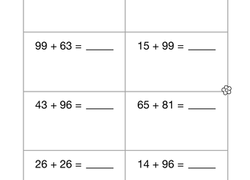 Use this glossary with the EL maths Support Lesson: Exploring Number Forms. 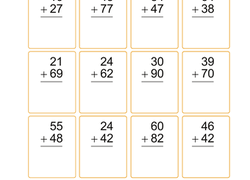 Vocabulary Cards: Which Number is the Greatest? Use these vocabulary cards with the EL maths Support Lesson: Which Number is the Greatest?